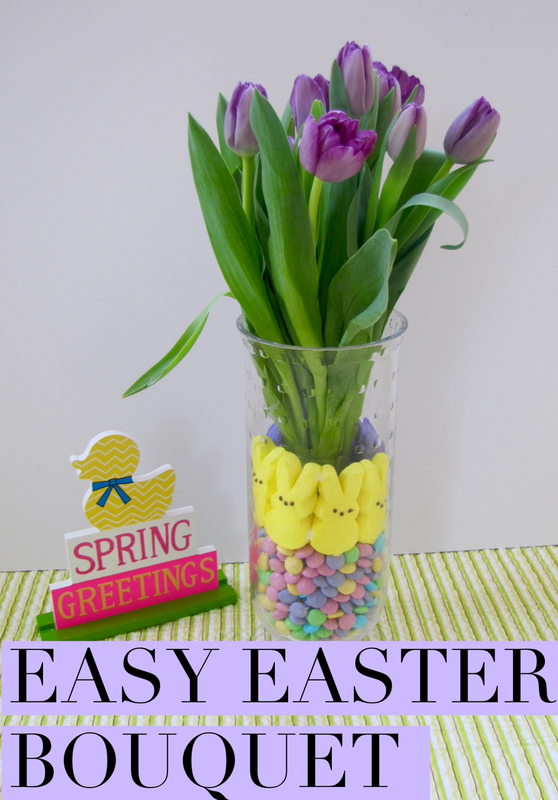 I'm in love with this easy Easter spring time bouquet centerpiece! Just seeing it on my kitchen table makes me smile and the room more festive. First, I picked up a bouquet of purple tulips at the grocery store, a bag of pastel Easter M&M's and two boxes of Bunny Peeps in yellow and purple to match the flowers. I then put the flowers in a small stem vase with water and placed it in a larger hurricane glass vase. 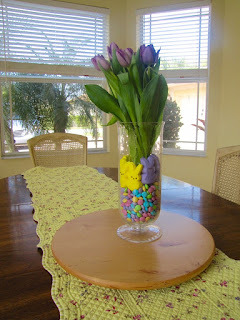 Next, I filled the hurricane glass with the bag of M&M's, which quickly worked to hide the tulips' vase, but you might need two bags of M&Ms depending on the size of your vase. Then, I placed the bunny Peeps on top of the hard shell candies and around the bowl for a fun border. Don't separate the individual Peeps, instead keep them in the sets of four that they come in for easier placement. That's it! TIP: You could also use Jelly Beans instead of M&M's if you wanted bolder colors in lieu of pastels. Too easy! 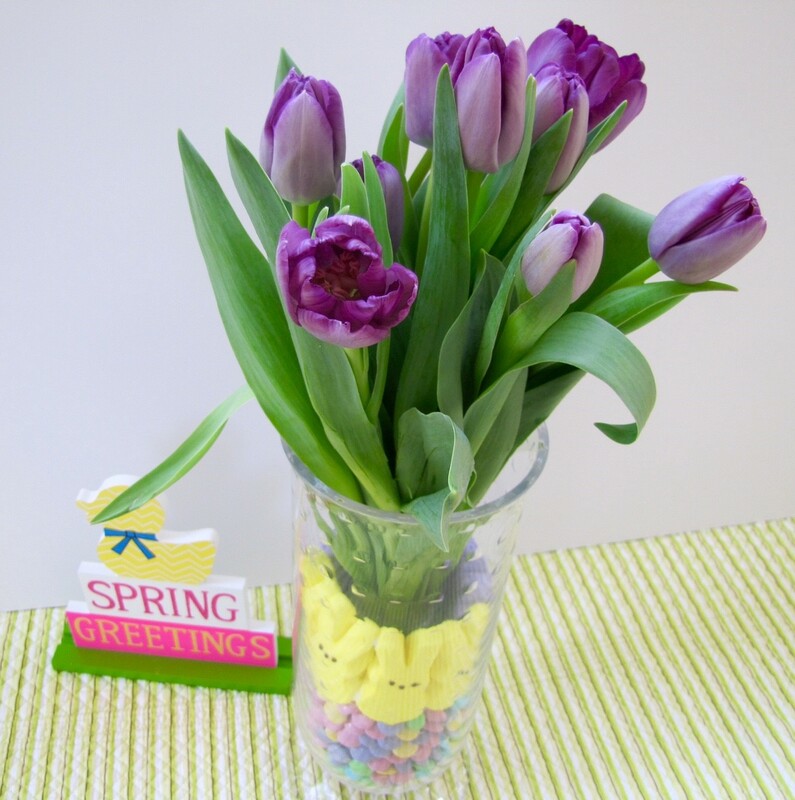 This is adorable and has so many bright cheerful colors for Spring! Adding to my list! 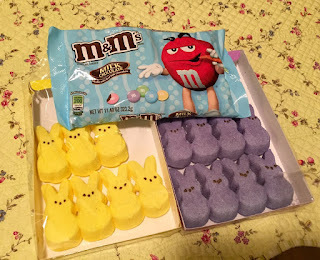 I have never tried Peeps before are they suitable for veggies? I love your Easter bouquet so lovely. Super cute! 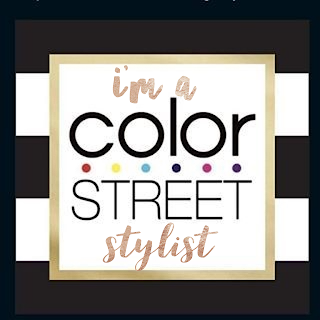 I made something similar and I absolutely love it. So bright and colorful! Awe How cute is this. 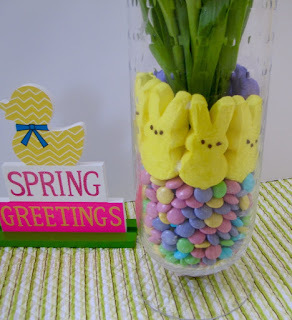 Love the fact that you incorporated candy into a flower bouquet. This is way too cute and creative!! I want to recreate this!! 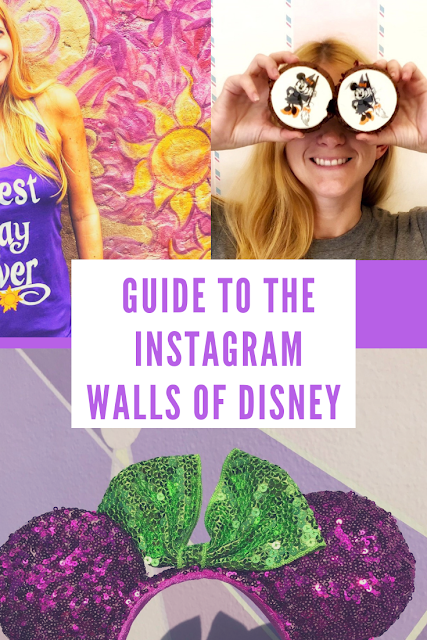 Such great ideas for us to try! Thank you for sharing. Making one of these tomorrow! I just found my vases and unfortunately I have to get more candy as we sort of ate all of it. Love how you used the peeps.. too cute! So cute, I can just see my kids trying to steal some candy out little by little. For me spring is the time for getting rid of the old and decorating with flowers. I love your festive bouquet! This is so cute and cheerful. Doesn't look too hard to do. Very creative idea. I love all the spring colors. And who doesn't love M&Ms! Omg what a cute bouquet!!!! I love how pees can be used for really anything! soooo cute ! love all the pastel.